We represent original server core in AdvExt64 Gracia Final extender version. The server functionality and game mechanics are neither replics nor a copy, but an original product. Everything works the way it should work on official servers: all weapons and armors types, quests, skills, transformations, elemental attributes, monsters and bosses etc. Also all retail-based bugs are fixed. There are no more reflection killings of the bosses, no hidden characters targeting, the Frintezza's behave exactly like it should, without delays. AdvExt Gracia Final is a result of a mixture between retail files and a set of AdvExt additions that allows you to create interesting and unique game projects. 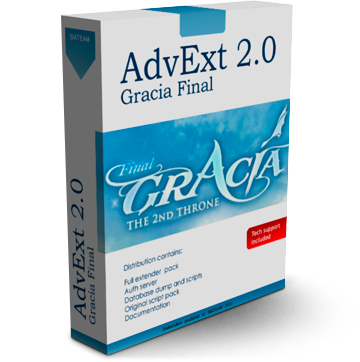 By purchasing AdvExt Gracia Final you are acquiring a set of components.